Every space, after a while, get’s unorganized due to misc. items placed in random spots. This kitchen is one of those examples. Busy families seldom get the time to take a 4 hour break to re-organize their kitchen. This client had a pretty good idea where she wanted her kitchen items. She stuck sticky notes on the outside of the cabinets so that we could stick closely to their current main areas for things. The non-kitchen stuff was moved to the pantry and to dining room storage, while the remainder was straightened up, and re-homed. The pantry, after a while, had gotten pretty mixed up. The pantry items were sorted according to what type of food they were and the clutter on the floor was cleared out. All of the shopping bags were stored together. Every cabinet was re-worked according to what type of kitchen item it held. Appliances were stored with appliances, and baking containers were nested together with other baking items. End result: clean, clutter-free counters and every kitchen item in it’s specific home! 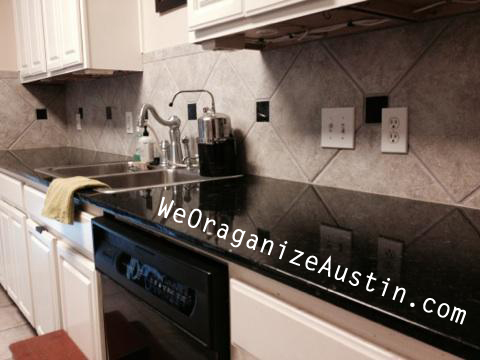 Posted on June 24, 2014 by shawnachildersPosted in Kitchens, Storage AreasTagged Austin, austin professional organizers, get organized, organized kitchen, organizing, professional organizing.